Welcome to Paella del Mar, a fusion contemporary Paella, Tapas and Dessert experience. We are about creating a memorable foodie experience through delicious unique flavours, aromas and theatre at every special occasion. Fragrant spices, fresh garden herbs and quality ingredients are pounded and mixed to create unique, mouth-watering aromatic flavours as our audience watch our paellas come to life in large pans. Our range of ‘flavourbomb’ handcrafted paellas are served with accompanying condiments to complement each flavour and to create the ultimate paella experience. All our paellas are Gluten Free and made with healthy brown rice. View our Paella del Mar flavours. Delicately crafted into a bite size mouth-watering dish, each Tapas is a flavour bomb on the palate. A great way to kick start an event or to simply graze on, our range of Tapas del Mar are a crowd pleaser for your guests. What’s best is that they are beautifully styled and presented to suit every occasion. View our range of Tapas. A wholesome and nutritious Moroccan eggs dish cooked in a delicious sauce; Shakshouka is perfect for breakfast or brunch. Our shouk is cooked and served from a large paella pan, gluten free and offers as a healthy vegetarian option. You can also choose to add on extras to make this dish even more tantalising. 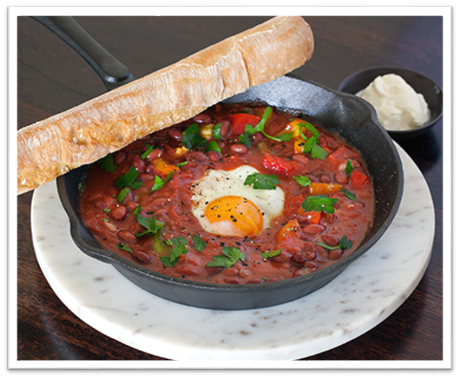 Learn more about our Shakshouka del Mar here. Join us on a culinary journey and check out our full Sydney Catering Menu. *We cater to all dietary requirements. We offer various event catering menu’s including vegan, vegetarian and gluten free.